Welcome to the MCHS eLibrary! 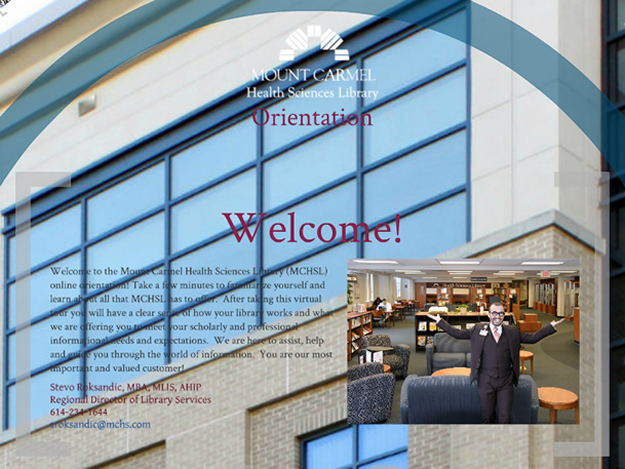 Welcome to the MCHSL online orientation! This orientation uses Prezi. If you are unfamiliar with Prezi, please view the following YouTube video: Ideas Matter by Prezi. More videos on Prezi are available on the Prezi YouTube channel. If you will be using Prezi to view the Library Orientation on an iOS (Apple) device, you will have to download the app from the Apple Store at Prezi for iPad or Prezi for iPhone. Disclaimer: Non-Mount Carmel organizations referenced on this website are identified for informational purposes only. Mount Carmel is not endorsing these organizations. The services these organizations provide, and the values or opinions they express, may not be consistent with the teachings of the Catholic Church and the Ethical and Religious Directives for Catholic Health Care Services. Mount Carmel makes no representations concerning the conduct or beliefs of these organizations. ©2019 Mount Carmel Health System Library. All rights reserved.